Virginia M. “Ginger” Olds, age 85, formerly of North Lakeview Avenue, Port Washington passed away Thursday, December 4, 2014 at the Milwaukee Catholic Home in Milwaukee where she has lived the past six years. She was born on October 2, 1929 in Green Bay, Wisconsin, daughter of Clyde and Hilda Gillis Fulsher. On November 26, 1949, she married Robert C. Olds of West Allis in Milwaukee. The family lived in Green Bay for a few years, but Virginia made her home in Port Washington for over 41 years. Ginger enjoyed being with and around people. For over 24 years, she was a waitress at the former Smith Bros. Restaurant in Port Washington. She later worked for over 15 years as a greeter for the Saukville Walmart. She and her husband loved to dance. She enjoyed reading and flower gardening. She had a soft spot for her kitties and a good movie. Robert Olds preceded her in death on August 19, 1991. She is survived by her children Jeniese (Jeffrey) Swatek of Olathe, Kansas; Linda (Gene) Berres of Mukwonago; Cheryl (Blake) Moret of Whitefish Bay; her daughter-in-law Heather (Mark) Petershack of Grafton, 13 grandchildren, 8 great-grandchildren, nieces, nephews, other relatives and friends. She is preceded in death by her husband, her son Robert Olds, Jr., infant daughters Glenda and Susan and daughter Jeanette and half-brother Richard Lewis. Funeral Mass will be at 1 pm Saturday. December 13, 2014 at St Peter of Alcantara Catholic Church, 1802 N. Wisconsin St., Port Washington. Reverend Thomas Lijewski will be the celebrant. Visitation will take place after 11 am Saturday AT CHURCH. Interment St. Mary’s Cemetery in Port Washington. Memorials to the American Stroke Association of SE WI (1555 N River Center Dr, Ste 212, Milwaukee, WI 53212) appreciated. 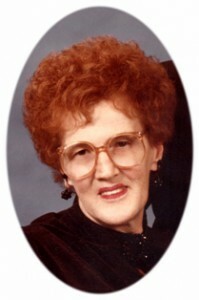 Next Post: DeBroux, Geralyn S.
I had the pleasure of working with Virginia at Wal-Mart for quite a while. She was quite a hoot on occasion! I am sorry to hear of her passing. Her memories will always be with you even tho she is gone. Please accept my condolences for your loss. I remember Ginger as Cheryl’s Mom but also as a co-worker at Smith Bros. all those many years ago. Ginger worked so hard and was always running. I admired that. My condolences to the Olds family and smiling to think of her I Love Lucy red hair!